Political temperatures rise over conflicts between urban and rural water use in Calif.
As California's drought persists, a growing awareness of scarcity in the state's urban regions has put agricultural water use under the political microscope. At the beginning of April, Gov. Jerry Brown ordered cities to cut their water use 25 percent, at the same time further exposing the tensions between competing demands (Greenwire, April 2). Federal and state officials are taking pains to defend the agriculture industry. Earlier this week in Reno, Nev., drought experts discussed how to counter the public perception that agriculture is getting off easier than the rest of the state. Ann Mills, the Agriculture Department's deputy undersecretary for natural resources and environment, said she had been spending "the better part of my days and some nights" working on correcting the "misperception that bubbled up" after Brown issued his executive order. She pointed out that many farmers have been facing water supply cuts for several years due to the current drought. Farmers south of the state's main water hub, the San Joaquin-Sacramento Delta, habitually have their deliveries from the Central Valley Project curtailed and haven't received their full allocation since 2006. This year, all agricultural users of the Central Valley Project are being cut, anywhere from 25 to 100 percent, forcing them to rely on groundwater or alternate deliveries. 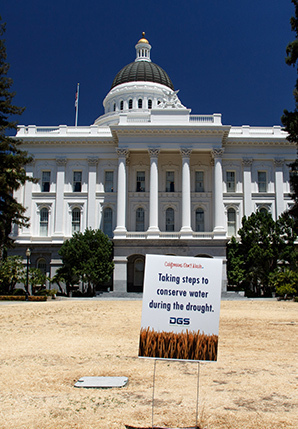 An early sign of the stress caused by California's drought showed up on the state Capitol's lawn last summer. This year's subject is political stress. Photo by Kevin Cortopassi, courtesy of Flickr. "There's the policy case to be made that agriculture's already taken some pretty tough hits," Mills said, speaking at the U.S. Drought Monitor Forum at the Desert Research Institute in Reno. "Whatever venue we're all in, we really do need to use that mantra 'We're all in this together,' because the alternative is just a very self-defeating path forward." The outcry may also be a function of the extremely managed nature of California's water system. While farmers have been subject to curtailments for years, urban users have been largely insulated from the consequences of the drought until now. "This is the perverse thing; if you have a well-designed system, it will look like you're not in drought," said Kelly Redmond, deputy director of the Desert Research Institute and Western Regional Climate Center. People arguing that agriculture needs to be subject to more regulations tend to invoke the 80 percent figure, as Rep. Jared Huffman (D), who represents Northern California, did last week (Greenwire, April 10). "You can't talk seriously about California's drought and how we're going to get through it without acknowledging that 80 percent of our water supply goes to agriculture, and most of it in the Central Valley," he said at a conference in Oakland. "Central Valley agriculture industry is to water what banks are to money. It's where almost all of it is." Critics have taken particular aim at farmers' continued planting of almonds and other nut trees, which require annual watering and thus increase the stakes in annual water allocation decisions by state and federal water managers. "My god, if we're asking all of this sacrifice from urban areas all over the state, let's look at the 8.3 million new almond trees that were planted during this drought -- permanent crops that can't be fallowed -- and let's ask, do they have available water supplies?" Huffman said Wednesday in an interview on San Francisco radio station KQED. California is by far the biggest exporter of processed fruit and nuts, and is growing fast, according to USDA data. From 2000 to 2013, its exports grew fivefold in value, while its share of national fruit and nut exports grew from 57 to 69 percent over the same period. The sector has also nearly doubled its share of the state's total agricultural exports, to 38 percent in 2013, up from about 20 percent in 2000. The president of the California Farm Bureau defended the industry's practices and invoked globalization as the root cause. "Folks are looking at our crops, saying, 'Well, you shouldn't be planting these water-thirsty almonds,'" said Paul Wenger on the same radio show. "Well, then, people ought to quit buying them. I am driven to produce what people are going to buy. And then we have folks say, 'Well, we shouldn't be exporting our crops to China and other places.' Well, then, quit buying things from China." Buying products manufactured in other countries only boosts foreign demand for California agriculture, he said. "We are building the middle class for other parts of the world. And what does that middle class want to do when they get increased income? They want to buy really good food. And where does that really good food come from? It comes from California." A longtime water policy and economics expert said that it wasn't that helpful to scrutinize individual crops' water use. "The whole sort of, 'How much water is on my plate,' it's not that useful for policy discussions," said Ellen Hanak, director of the Water Policy Center at the nonprofit Public Policy Institute of California, a prominent think tank whose members have in the past attempted to pierce various politically facile narratives about California's water policies. "There's water in everything that we consume, so there's water in all food," she said. "Do you want people to be consuming diets that are based on crops that use the least water? I think market signals will take care of that. If water becomes so scarce that almonds become really expensive, people will stop buying them." The group came out with a Bechtel Foundation-funded report this month laying out the challenges for the water sector in a warming climate. It found that by continuing to shift to higher-value crops and resorting to groundwater pumping, farmers could still expect higher revenues, which can partly offset fallowed acreage and job losses. It's actually a good thing that farmers are using almonds and pistachios to extract more economic productivity out of the same amount of water, she said. The value of California's agricultural output has more than doubled since the late 1960s, despite little to no changes in acreage or irrigation levels, according to the PPIC report. The same pressures are encouraging cattle ranchers to keep roughly as many beef cows as they did before the drought, even though the cost of feed -- such as water-intensive alfalfa -- has increased. Farmers currently have about 600,000 cows, compared to 620,000 before grazing fields dried up. "Prices are high, and our export markets are booming, too," said Justin Oldfield, vice president of government affairs for the California Cattlemen's Association, speaking at the drought conference. "Consumers continue to buy beef at record high prices, and our export market expands." Cap and trade coming for groundwater? However, the expansion of permanent crops is also hurting the cattle industry's ability to find grazing land in the San Joaquin Valley, he said. "I grow grapes, too; I don't want to be a hypocrite, but it's interesting to see how extensive agriculture has grown outside the floor of the valley." Hanak also dismissed the charge that agriculture takes up a disproportionate amount of land and water considering that the sector accounts for just 2 percent of California's gross product and 4 percent of its jobs. "It takes up land, and it takes up water," she said. "We've got a lot of both in California, so it's not like there's some real reason why it shouldn't be happening." Also, the state's dry summer climate is actually well-suited to agriculture, she said, because it discourages pests and fungi. Rather than re-examining which crops should be planted, as some have advocated, Hanak said the state's new groundwater law would slowly work to get crops in balance with their supplies. The law, passed last year, requires the creation of local groundwater sustainability agencies, which must write plans by 2020 to get the most overdrafted basins into shape by 2040. "This is not the time to stop pumping groundwater," she said. "It's a very good time to start putting in place the institutions that'll be able to manage these basins." Groundwater regulations can lead to market-based tools similar to California's cap-and-trade system for greenhouse gases. "Let farmers make or break their banks by the crops that they choose," she said. "Let's just make sure everyone's on a level playing field when it comes to the water that they use."